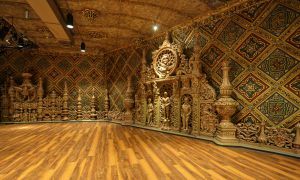 The Cabaret is an intimate room furnished in rich woods and intricate carvings, featuring the original proscenium statuary. With its open and inviting layout, the Cabaret is great for small parties or conferences and is equipped with audio/visual capabilities. Bring a little beauty to your business meeting! 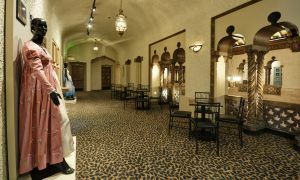 Decorated in a gorgeous Spanish Baroque style with intricate décor, the Grand Lobby is the ideal backdrop for your event. This long, open space is conveniently located on the first floor and can seat guests in intimate layouts with a large wooden bar centrally located for your refreshments. 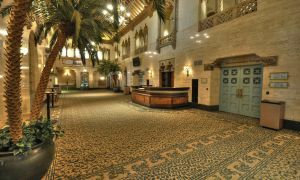 The Grand Lobby can be used in its entirety or in sections for a more private atmosphere. Included in this rental is the second floor Mezzanine, which provides additional seating and walking room! 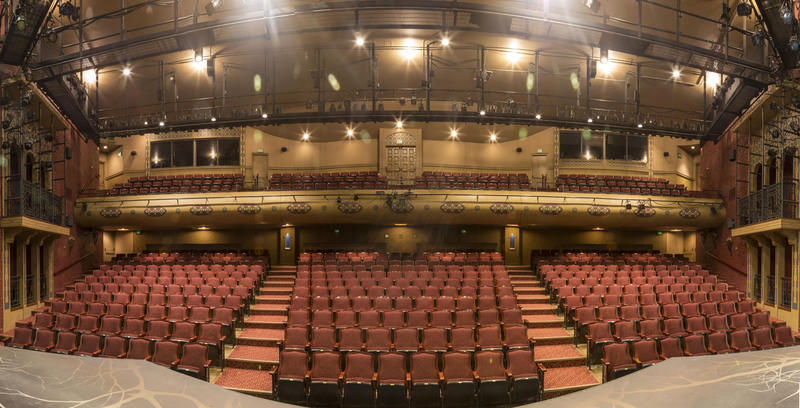 Many premiere actors and lecturers from across the region and country have graced the Indiana Repertory Theatre’s stages over the years. With its beautiful proscenium arch and 600+ seat house, this space is perfect for graduation and pinning ceremonies to lectures and seminars. Let us help put you in the limelight! 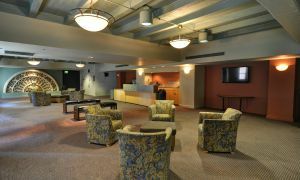 The second floor houses the Mezzanine, and oval ambulatory with extra seating and a great view of the Grand Lobby. It is accessible by two marble staircases and an elevator. 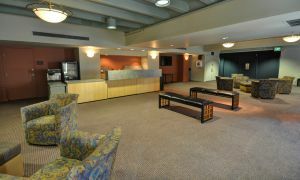 With a private bar and beautiful gallery, the Mezzanine can support pre-show or post-show receptions seamlessly! What a view! Looking out onto historic Washington Street, the Upperstage Lobby is located on the fourth floor and is perfect for mingling with friends over a cocktail hour or hosting a small dinner. Its contemporary design and open floor plan allow for a more flexible environment. The bar is centrally located and a coat closet is available for use. The Upperstage is an intimate space with seating on three sides; commonly referred to as a thrust stage. The forward-facing center section seats nearly 200 people. Its simple architecture provides a blank canvas for your next event. Perfect for engaging with your audience or peers. For information regarding venue rentals contact Margaret Lehtinen, Manager of Public Operations at 317.916.4880 or mlehtinen@irtlive.com. A $500 Technical Fee will be applied to all stage rentals. This covers the first four hours of work and includes a Deck Manager, Electrician, Audio Engineer, two (2) wireless handheld microphones, and a general lighting wash. Additional charges will be assessed after the fully-detailed rider is provided. For more information regarding stage rentals, contact Jane Robison, General Manager, at 317.916.4811 or Brian Newman, Production Manager, at 317.916.4870. HOST: There will be a minimum drink charge of $250 for the first two hours and $125 for each additional hour or fraction thereof. There will be a bartending fee of 20% total drink sales with a minimum of $50 per bartender per two hours and $25 per bartender for each additional hour or fraction thereof. Bartenders will be based on every 100 persons. CASH: Cash bar sales must equal $250 for the first two hours. If they do not, Renter agrees to pay the difference. After the first two hours, cash bar sales must equal $125 for each additional hour or fraction thereof. Difference between actual sales and minimum charge will be invoiced. There will be a bartending fee of 20% total drink sales with a minimum of $50 per bartender per two hours and $25 per bartender for each additional hour or fraction thereof. Bartenders will be based on every 100 persons.